This is for a super nice 2016 Panini INFINITY " ROOKIE AUTO" # RA-AH AUSTIN HOOPER Rc. VERY NICE RC AUTO ! 2016 Absolute Austin Hooper Rookie Ink Auto & Optic RC. 2016 Panini Black Gold Collegiate Austin Hooper Team Symbols 60/99. ENDING SOON. We are constantly buying and adding new products to our inventory. We provide high resolution scans of the front and back of all cards. Other (357). Item is in perfect condition and has been freshly taken out of the pack. Happy buying! Austin Hooper 2016 Panini Chivalry Parallel Rookie RC #260 #ed 014/199 - RARE! RARE 2016 Panini Football Austin Hooper Chivalry Parallel Rookie card #260 serial numbered 014/199 in near mint to mint condition. You will receive the actual card shown. 2016 Panini Spectra Neon Green Rookie Autograph Auto AUSTIN HOOPER /25 - FALCONS. Condition is Like New. Shipped with USPS First Class Package. 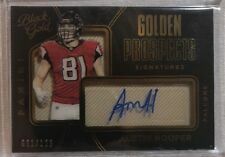 AUSTIN HOOPER Short Printed Autograph Rookie Card ! Incredible opportunity to own a RARE CARD of the incredible 2016 Panini National Treasures Football set. Serial Numbered 70/81 Ruby Red Version! Combined shipping available on all listings Domestic Shipping is $2.75 flat rate for up to 30 cards. After that, additional .10 per card. WE WILL NOTE ANY FLAWS OR DEFECTS THAT WE THINK ARE PERTINENT. You will receive the exact card pictured. 2016 Prestige Xtra Points Red Austin Hooper. item number 5120. This is an Austin Hooper Rookie card. This is a great card for your collection. Player: Austin Hooper. Team: Atlanta Falcons. Card Number: 152. I try to keep things as low as possible. This card is number 152 from the Rated Rookies Purple set from 2016 Donruss Optic Football. Player - Austin Hooper. Player: Austin Hooper. Team - Atlanta Falcons. Year / Season - 2016. Team: Atlanta Falcons. This parallel card is number 186 from the Rookies Pink set from 2016 Panini Phoenix Football. Player - Austin Hooper. Player: Austin Hooper. Team - Atlanta Falcons. Year / Season - 2016. Team: Atlanta Falcons. AUSTIN HOOPER 2016 PANINI PRIME SIGNATURES "PRIME PROSPECTS AUTO" #'RD ! CARD IS SERIAL #'rd 180/199. Card was pulled and placed directly into sleeve, top loader and team bag. #139 AUSTIN HOOPER. 2016 PANINI CLEAR VISION NFL. GOLD ROOKIE PARALLEL CARD. AUSTIN HOOPER 2016 PANINI INFINITY ROOKIE AUTOGRAPH #'rd /388 !! 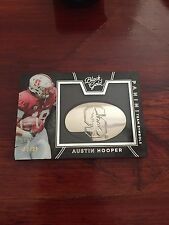 This is for a super nice 2016 Panini INFINITY ROOKIE AUTOGRAPH # RA-AUSTIN HOOPER. Card is serial #'rd 043/388 ! 2016 Panini Unparalleled Austin Hooper Rookie!! #154 (Falcons)!! Look!! Hot!! 2016 Panini Unparalleled Austin Hooper Rookie. Card is in Great condition!